A view from the "crow's nest" - 88 feet above the decks of the Odyssey. The Humpback whale, mother/calf pair rode the bow wave generated by the boat for 3 hours. Watch a special video footage of this extraordinary event. 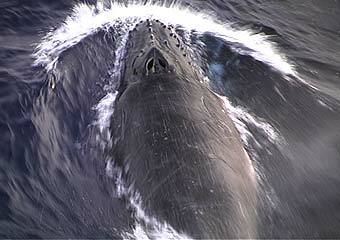 Watch special video footage captured of the bowriding Humpback whales. This is Genevieve Johnson speaking to you from the Odyssey just north of the equator in the central Indian Ocean. Days like today remind all of us onboard why we joined the Voyage of the Odyssey - to witness and study events at sea that most people on the planet will never get to experience in their lifetimes. At about 3.30 pm today, First Mate Mark Preedy was on observation watch. The sea was extremely calm with very few whitecaps, so when he noticed a rather long rolling patch of white water at the surface that didn't appear to dissipate, it caught his attention. Sure enough a blow shot skyward, "we have a whale", Mark shouted down into the pilothouse. Because of the angle of the blow, we knew that this was not a sperm whale. The crew rushed out onto the deck with photo identification cameras and binoculars in hand. The animal was about 300 meters off our starboard bow heading directly toward Odyssey. Captain Bob turned off the engine as we watched from the bowsprit. There was a distinct wake being pushed ahead of the whale. As it approached, we realized there were two animals, the second being far smaller. Was it a mother/calf pair and what species were they? With jib and main sails set, the Odyssey sailed at a steady 5 knots on a southerly course. The whales were now 150 meters ahead of the bow. The first whale was huge! Rather than tapering down from her dorsal fin, her back was a like an enormous flat table top, her girth was incredible--her back was perhaps four meters across. Suddenly, the two whales slowed and fell parallel to our course. When they surfaced we had a perfect lateral view. We saw the large whale just below the surface, not more than 50 meters off our beam. Then it rose out of the sea, the head pushing a clear window of water just before breaking the surface. The rostrum was covered with tubercles. It was a humpback whale, an animal of staggering proportions, larger than any humpback any of the crew had ever seen before. Her dark, heavily scarred body rolled above the surface revealing the distinctive humped dorsal that gave these whales their name. Then to our delight, a calf emerged at her side, a perfect miniature of its mother in every way. Not a new born, this calf was perhaps four or five months old and still sporting the characteristic pale grey coloring of a very young animal. We stayed on course so as not interfere with the behavior of the humpbacks. To our amazement, the mother/calf pair moved in closer on a parallel course with Odyssey and we glided together over the Indian Ocean. They broke the ocean surface every few seconds, the mother expelling a column of vapor that floated momentarily in our direction before soaking us in a fishy blanket of mist. Everyone laughed, relishing their whale shower. The mother remained only a few feet below the surface, her calf always at her side. She actually allowed her calf to move between her and the Odyssey, adisplay of seeming confidence. Was she showing that she trusted us? Almost half an hour had passed and the whales were still with us, Captain Bob had not changed course or speed, it appeared as though these whales had chosen to stay and travel with us. Without warning, the mother blew hard before turning toward us, stirring her huge flukes she propelled herself forward then arched her mountainous back, gallons of water sloshing down her sides. We were shocked all over again by her sheer size as she dove no more than five meters from the boat. 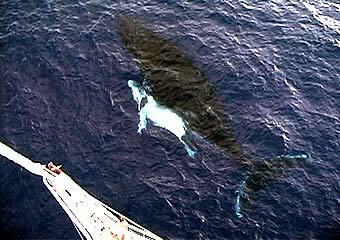 She and the calf were directly beneath our keel, we could see them rolling over, exposing their white, blotchy bellies. Then, unbelievably, she was beneath the bowsprit, this whale was bow riding! We were all absolutely astonished by this behavior. We often enjoy the antics of bowriding dolphins, but these were our first bowriding whales. Her long white pectoral fins were stretched out like the wings of an underwater albatross as she rode the pressure wave that Odyssey pushed ahead of her. 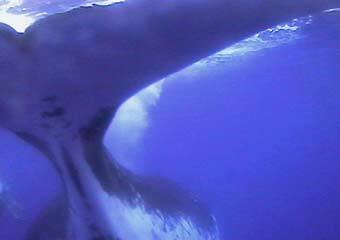 An underwater view from the Odyssey BOWCAM of the female Humpback whale. Next, just below the surface, the calf criss-crossed over its mother's immense back. Sometimes as the mother rose to take a breath she would arch before descending, which sent the calf tumbling and rolling gently down her flanks. The pair would constantly touch one another with their huge pectoral fins. It left us wondering whether this maneuver is used to check each other's position or simply for reassurance, or perhaps because like humans, they enjoy the sensation of body contact? The deck was silent; none of the crew could speak. We were in awe of these beautiful animals. Both humpbacks were covered in deep white scratches. The calf, in particular, had marks across its tail stock resembling the rake marks of teeth. Perhaps the pair had previously been tested by marauding orcas? For now these whales had not a care in the world, perhaps they were simply having fun, making the most of a free ride. As we witnessed the events unfold before us, none of us could help think that these whales were playing as they rolled beneath us, flying weightless through their ocean realm. Apparently calm and relaxed, the mother/calf pair moved effortlessly back and forth, surfacing in unison to breathe. Every so often they turned on their sides to take a look at the strange creatures seated above, peering down at them with such wide, excited eyes. Sometimes it seemed as though the mother was actually teaching her calf the art of bow riding. There are very few words to adequately portray what we all felt and experienced today. All I can say is that this mother and her calf were quite simply the most moving and beautiful spectacle I have ever seen in my life. They brought tears to my eyes. 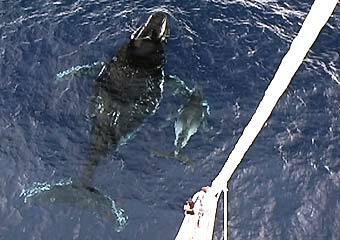 The calf rolls on its side to get a better look at the crew gazing from the bow of the Odyssey. The whales stayed with us for three unforgettable hours until the sun was finally absorbed by the horizon. We hove to and drifted for a while listening to the powerful, exuberant exhalations until finally we could hear them no more. Could it be, such encounters that may once have been common, are now reserved only for those who venture into the most remote and undisturbed corners of the wild world, where the ravages of humanity are minimal? Tragically, it was the tendency of these whales to approach boats that led to their downfall during the whaling days. Yet this whale that most probably was old enough to remember that era, freely interacted with us, demonstrating complete trust toward a species that almost drove her kind to extinction. How many humpbacks in recent history have survived an encounter with a boat so far offshore? How poignant that she had so willingly brought her calf to Odyssey, a boat working for the conservation of whales. That point was not lost on any of us! This was a whale watch of a different kind. We were over 500 miles from land and she had come to view us!We were in her world and she was dictating the terms. The sky was clear and the seas calm, just humans and whales spending the afternoon in each other's company, simply because they chose to do so. If only we would let them, perhaps whales would choose to seek out our company more often..
Dr. Roger Payne discusses the song of the Humpback whale. Listen to and learn more about Humpback whales, the ocean's elaborate composers. Read more about one Odyssey crewmember's experiences working with Humpback whales.